Another die I just got that I love. These Fir Trees are fabulous. 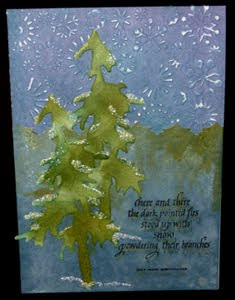 Just click on the card to see details and descriptions and the trials and tribulations i went through to make it - Sigh!! A gorgeous card!!! I have times like that too!!!!! This is absolutely stunning Yogi and worth the hassles you went through to get the final product. Fabulous! Very nice! Thanks for playing along with The Character Cafe this week! Great card!! I am going to have to check out that die!! Gorgeous...after all your troubles the end result is very stunning!! Most crafters would have jumped ship after the first one...you're a trooper. So glad you joined us at The Character Cafe this week. What a hassle! I do love how you kept going at it! I have learned to do that recently figuring that is what makes it a homemade card! I actually like the extra print of the sentiment, adds a neat touch! Thanks for joining us at The Character Cafe! You may have gone through a lot to get there, but it was well worth it! Beautiful job! Thanks for sharing your talent with us at The Character Cafe! Hope you can join us again this week. Wow those trees are such a great shape!